Haunted Magazine is a FREE magazine about all things, ghostly, spooky and things that go bump in the night. Its primary aim is to do what a magazine should – entertain its readers. It’s not there to preach, to bamboozle you with science. It’s packed full of paranormal pleasure. It has a modern and fun approach to the history and mystery of the paranormal. 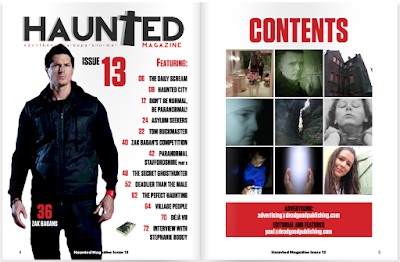 It is written and designed for you – because, essentially, we are YOU, we’re lovers of the paranormal, we love ghost stories, we love exploring the unknown and we love being creative with Haunted Magazine. Paul Stevenson and Andy Soar are the driving force behind Haunted Magazine, backed up by some fantastic writers and photographers along the way. Both with different skill-sets they work hand in hand to make Haunted Magazine the best it can be. Their modus operandi is simple; Paul creates a paranormal jigsaw and gives it to Andy to finish, adding his design stamp all over it. They normally finish their jigsaw every other month, which is no mean feat considering it normally says 4-6 years on the box. There’s no other magazine like it in the paranormal genre. I've just discovered your magazine and I'm enjoying it greatly. Very intereted to see that Haunted is a FREE magazine, yet the Pocket Mags app charges 99p per issue. Do you know why this is? They only allow one issue at a time to be FREE, however as we produce 4 magazines a year, the latest issue (at that time) is free for a very long time, it's just the way the app is set up with them. That is why we also publish the magazine on free magazine platform Issuu, if you go to www.issuu.com and type in Haunted Magazine, you will see all our back issues and it won't cost you a penny. Based in the US and although I speak for myself we LOVE your magazine over here, it's about time the US did something like this. Over here it's far too science based, we need a proper magazine for the paranormal and we love your style, the way you engage a reader is awesome. Hello from NYC - three blocks from the Empire State Building. photos to publications around the world. weekly Exploring The Bizarre show. Is it posable to get a subscription in print form?